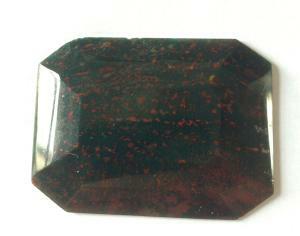 BLOODSTONE is a green, red spotted variety of chalcedony. Also known as heliotrope. The red spots are caused by the presence of iron oxides. BLOODSTONE is a variety of chalcedony. It strengthens/toughens and oxygenates blood stream, enhances physical and mental vitality, strengthens heart, spleen, bone marrow, aids in balancing iron deficiencies, reduces emotional and mental stress, powerful physical healer, stimulates movement of kundalini.Links root chakra with heart, inspires intuition, inner guidance, altruism, idealism and spiritual solidarity. BLOODSTONE is the Traditional and Ayurvedic Birthstone of the star sign ARIES and the Mystical Birthstone of the zodiac sign PISCES. It also has a Modern association with the star sign SAGITTARIUS. The 17th century astrologer William Lilly associated bloodstone to the planet MARS. BLOODSTONE is connected to Muladhara - the Root Chakra ( 1 ) and Anahata, the Heart Chakra ( 4 ).